Jade Leigh is a Goth girl, and very proud of it. A little too proud, maybe. She doesn’t care what all the boring Barbies in her high school think about her and her small group of Goth friends. She doesn’t care what her dad, a single father since the death of her mother two years ago, thinks about it. But, inevitably, she crosses the line. She talks back to her trig teacher and arrives at Principal Hamilton’s office one too many times. Expecting to be suspended, at worst, Jade is very surprised when Ms. Hamilton tells her to report back first thing tomorrow morning, when she’ll get her punishment. The following morning, Jade’s surprise increases when she realizes that her dad has been in conference with the principal already. And she’s confused, if a little amused, to see her nemesis, Mercedes Turner, blonde Barbie and all-around “it” girl, awaiting punishment, too. That punishment will take the form of a field trip. Jade expects a lame trip to a drug rehab or a home for unwed mothers. Instead, she and Mercedes are strapped to tables, injected with who-knows-what, and placed in a virtual reality simulation. Doesn’t sound too bad? Right. 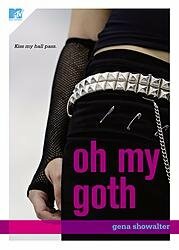 Until Jade looks around and realized the whole school is Goth, she’s the much loved “it” girl dating the captain of the football team, and the Barbies are now the outcasts. Her own friends are now Barbies and despise her. No one believes the virtual reality thing. And what's with the hot new guy, Clarik? Jade narrates the story in first person, and anyone who has ever been to high school will be able to identify with most of what she has to say. Doesn’t matter if you are/were Goth, Barbie, freak, or geek, some things about high school are the same for everyone. Each chapter starts with a great quote from Jade’s journals. Jade’s first day as Popular Girl is both kind of scary, and very funny. Mercedes’ parallel experience as part of the outcast group is entertaining, both for the reader and for Jade. The author blends a great high school story with some interesting fantasy elements. Readers from high school age to adult will find it hard to put this one down.